Dennis Bryant is with Bryant’s Maritime Consulting, and a regu- lin in 1979 with a BA Hons Degree in Natural Sciences (Chem- any advertising. 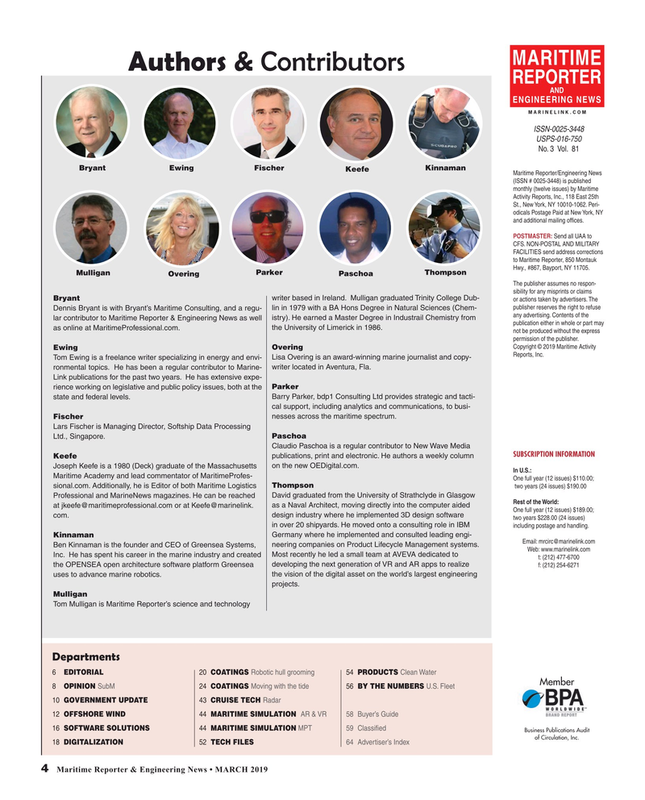 Contents of the lar contributor to Maritime Reporter & Engineering News as well istry). He earned a Master Degree in Industrail Chemistry from publication either in whole or part may as online at MaritimeProfessional.com. the University of Limerick in 1986. not be produced without the express permission of the publisher. Tom Ewing is a freelance writer specializing in energy and envi- Lisa Overing is an award-winning marine journalist and copy- ronmental topics. He has been a regular contributor to Marine- writer located in Aventura, Fla.
Fischer nesses across the maritime spectrum. Joseph Keefe is a 1980 (Deck) graduate of the Massachusetts on the new OEDigital.com. One full year (12 issues) $189.00; com. design industry where he implemented 3D design software two years $228.00 (24 issues) in over 20 shipyards. He moved onto a consulting role in IBM including postage and handling. Ben Kinnaman is the founder and CEO of Greensea Systems, neering companies on Product Lifecycle Management systems. Inc. He has spent his career in the marine industry and created Most recently he led a small team at AVEVA dedicated to t: (212) 477-6700 the OPENSEA open architecture software platform Greensea developing the next generation of VR and AR apps to realize f: (212) 254-6271 uses to advance marine robotics. the vision of the digital asset on the world’s largest engineering projects.